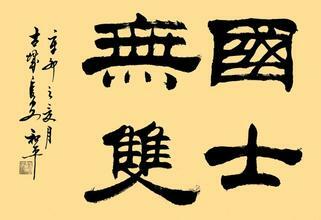 First, recall what we have learnt in our lesson of character 王. Comparing to 王, 士 are those person who donot have the capability to comminucate with heaven / gods. However 士 can still communicate with earth. Heaven represents spiritual while earth represents material. Second, 士 is composed of 十 and 一, it means 士 is capable of demical arithmatical calculation: If an individual sum is 10, the result is represented with two digits. current position has value 0, and the adjacent left position would have a carry of the value 1. With the concept from above two hints cobined, overally speaking, 士 is the person who is capable of logical deduction and can foretell or prophesy (an event in the future), based on material facts. They are mostly scholars or officers, working under 王's commands. 士 means scholars or officers. Please note that the upper horizontal line of 士 is longer than the lower one. While we were learning 三, we knew that middle horizontal line of 三 represents human being. I think 士 makes the line, which represents people, longer to emphasize 士 is a character related to people. Based on this understanding, we will then be not surprised to see another Chinese character 土, which has its bottom line longer. It is because 土 is related to earth.